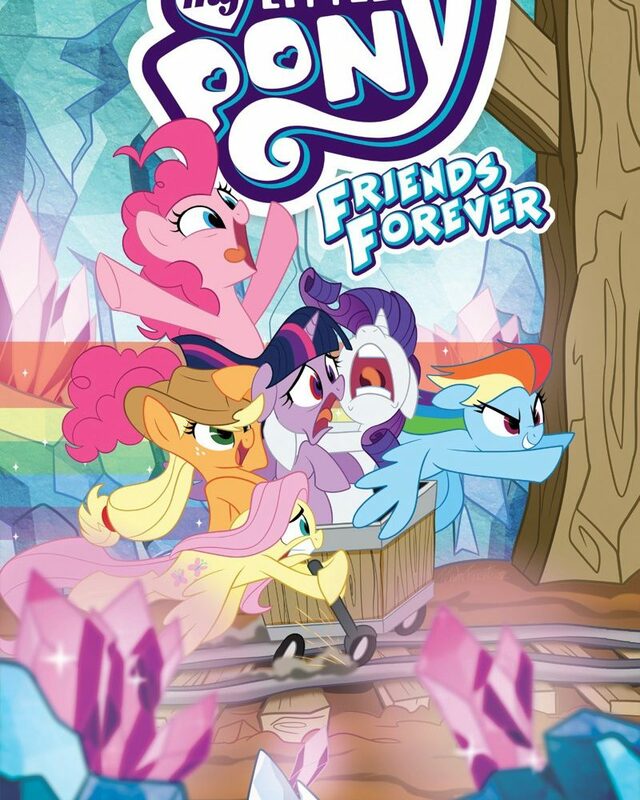 Volume 8 collects Issues 29-33 of the Friends Forever comic series. Inside we have five tales of friendship, the struggles it faces and some great adventures along the way. 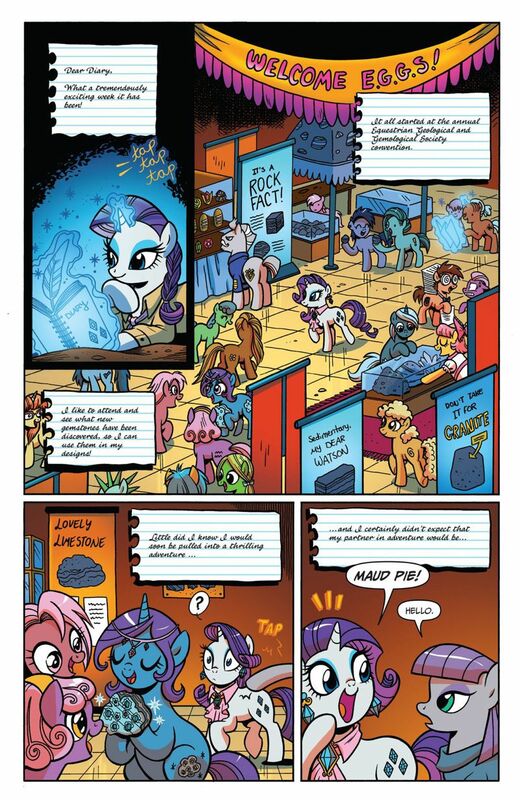 Rarity comes to the aid of Geology student – Maud Pie. Twilight visits the Crystal Kingdom ahead of Princess Cadance court celebration. Rainbow Dash comes to the assistance of the Buffalo tribe and her young friend Little Strongheart. Daring Do enlists the help of Fluttershy in her next daring adventure. Whilst AppleJack helps Cherry Jubilee settle an old argument with a travelling rodeo show. A diverse collection of stories that would have been complete if it included just one issue with Pinkie Pie. Recounting five issues that were released in the last few months. Each story had a unique pairing, such as Rarity and Maud. Where Rarity is a strong and outspoken pony, Maud is more reserved in her expressions. Although that doesn’t mean she has no feelings, in fact she is a keen writer. Princess Cadance, although she rules the Crystal Empire, is going through a difficult time where she believes her subjects have a false opinion of her. Believing that they only see her as a pretty face, Cadences’ self confidence takes a direct hit, thus affecting the Crystal Heart. Rainbow Dash accompanies the young Little Strongheart cross country, on the mission to retrieve a legendary feather from a bird of folklore. Rainbow Dash is known for her strong opinions, yet in this story she puts them all aside and helps the Buffalos with an open mind, respecting their beliefs. Daring Do, an adventurer known across Equestria for her dangerous quests, enlists the assistance of Fluttershy in her latest escapade. While AppleJack helps out Cherry Jubilee with more than her harvest, when a roaming rodeo show comes to town. Rarity and Maud are still the most unlikeliest of friends to me. Where Rarity has a passion for fashion and gemstones, as well as an outspoken personality, Maud is her direct opposite. A quiet, very reserved pony and somehow a sister to Pinkie Pie. Their family is just full of surprises. By the end of the first story, we understand just how grateful Maud is having Rarity to push her on this adventure. A real insight into Maud’s character! Like I mentioned in the previous paragraph, Rainbow Dash puts her own opinions aside and respectfully listens to the Buffalos request. Following their legend in order to find a mythical bird, and retrieve one of its magical feathers so as to fulfill a superstitious belief. This story really does leave a positive lesson for all readers, be they young or old. It’s a nice reminder. Our last story could have ended very differently as Applejack was in a very tricky situation. Having done her own research, she uncovered information on Cherry Jubilee’s past. Something that was very private and for which Jubilee asked Applejack not to interfere with. A delicate situation that is sometimes best avoided, but this tale ultimately ended on a more positive note. There is never a My Little Pony adventure without some form of drama. Rarity and Maud race against a rival team of geologists, to reach the recently discovered cave beneath Crystal Mountain Range. A discovery that they would be credited for and a huge step forward for Maud’s career. Unfortunately their rivals play a few nasty tricks, but together the fillies are bound to succeed. Twilight and Shining Armor must try and reassure Princess Cadence of her importance in the Crystal Empire, as her lack of confidence spirals downwards. Rainbow Dash and Little Strongheart must race across a dangerous path in order to reach the home of the legendary Rainbow Crow, but time is of the essence. Daring Do takes the most timid pony in Equestria on a dangerous expedition. Filled with vicious wild animals, traps, bad guys and one of Daring Do’s menacing foes. Certainly not the quiet evening Fluttershy had hoped for. With a total of five issues combined in this single collection, there is a diverse amount of varied illustrative styles inside. Brenda Hickey and Ted Anderson brought us the story of Rarity & Maud Pie. The character designs used by this duo are the closest resembling the animated series, making a great transition for first time readers to get into the comics. Twilight and Cadance story is by Christina Rice & Agnes Garbowska, known for their very wide eyed approach to the characters. Making them more animated in reactions and movement, allowing each of their feelings to really shine through to the reader. Tony Fleecs and Sara Richard delivered Rainbow Dash & Little Stronghearts tale, with a more plump and well rounded character designs. More child friendly in my eyes, making them just extra cute looking as well. However the images used for the story of the Rainbow Crow are just stunning. A complete change in art style from the rest of the issue, using a dream world style full of captivating colors. Really the most impressive series of pages in the entire Issue. Ted Anderson and Jay Fosgitt brought us Fluttershy & Daring Do, an art style that I find resembles the newer 2016 Mickey Mouse comics. With adorable illustrations and designs that make it so easy to try yourself. It just gives a very cheery vibe from the whole design layout. Whilst Christina Rice and Tony Fleecs gave us Applejack & Cherry Jubilee. Once again giving us a similar style to the Rainbow Dash and Little Strongheart tale. Good colors, clear cute design with a lot of detail even for the background characters. Finally we have the cover, pictured above, by Trish Forstner. Her first work on both My Little Pony and with IDW Publishing. Some very promising talent here as the cover is flawless. Our Mane Six are speeding down a mine tunnel, whilst some enjoy the thrill of the ride, a few others – not so much. Bright colorful designs, true to each of their characters. The forefront of the image has some out of focus gems, an interesting technique usually seen in camerawork. Making sure all of our focus is on the ponies. Even the background wall catches my attention with how well it’s designed, in both color selection and carved features. 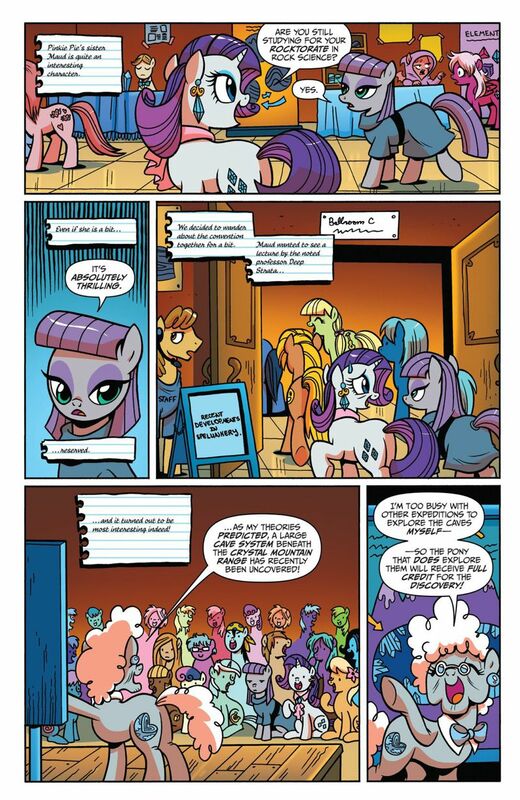 Once again another brilliant My Little Pony comic collection to buy. Housing five of the most recent Friends Forever Issues in one handy release. Perfect to read on the move and certainly one to share with the kids.